The Yoothamurra Homestead is situated on a stud farm on the outskirts of Perth, approximately 35kms from the CBD in the suburb of Oakford. The original cottage has been extended and renovated to provide a large, seven bedroom house which can provide ideal accommodation for the bride and groom, along with their bridal party or close family. If you’re not looking for a church wedding, both the ceremony and reception can be held at our location, with plenty of parking available for your guests. 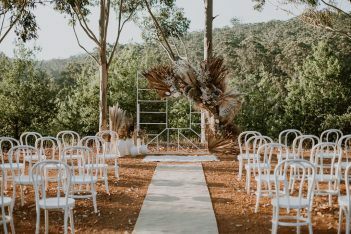 We have a large lawn area, surrounded by gum trees that is the perfect location for a marquee of your choice to cater for the larger weddings. For the smaller, more intimate weddings, the reception could be held in the Yoothamurra Homestead. At Yoothamurra, you have the freedom to plan and organise your wedding the way you want. You may decide to have a simple rustic BBQ or perhaps a more elaborate event. The decision is yours! We have a fantastic caterer that knows our property and has managed previous weddings for us. They can supply you with a great choice of menu options, along with an affordable and flexible beverage package. If you would prefer to BYO your beverages, this is also available (small fee applies). An increasing number of couples are moving away from the ‘traditional’ wedding style and are looking for something a bit more rustic and unique. At Yoothamurra, there is no need to travel for hours looking for that location. You can have it all and just 35kms from the city of Perth. Please contact Tracey Tanis to arrange viewings. Scentiment Flowers - beautiful, bespoke and unforgettable wedding flowers delivered and styled throughout the south west of WA. Big Dreamers | Hopeless Romantics | Manifesting Dashing Wedding Dresses for modest budgets and BIG Dreams.